Discussion in 'Google TV General Discussion' started by CatfishRivers, Nov 21, 2011. Nov 22 (Reuters) - "Samsung Electronics , the world's top TV maker, is in last-stage talks with Google to roll out Google TV, the head of Samsung's TV division told reporters on Tuesday. Yoon Boo-keun, president of Samsung's TV division, said the company planned to unveil its Google TV at an event next year, but not the Consumer Electronics Show in January. He added that Samsung's Google TV offering would differ from those of competitors. Google TV -- which currently comes built-in on certain Sony Corp television models and on Logitech International set-top boxes -- allows consumers to access online videos and websites on their TVs, as well as specialised apps such as video games." These days, it seems like the Korean electronics firm is on a roll. Not only did Samsung recently beat out Apple as the number one smartphone seller, its Galaxy S2 was named the best smartphone in the U.S. by Consumer Reports magazine. The company shipped a whopping 27.8 million smartphones during the third quarter of 2011, rising 14.5 percent compared to last year. Samsung still has a few bumps to smooth over, but any way you look at it, those are some impressive numbers." Samsung Electronics is generating massive buzz for its upcoming Internet television based on Googles smart TV platform. And just as in smartphones, the Korean technology giant finds Apple as its main rival. Samsung, the worlds largest flat screen television maker and runner-up handset vendor, is one of the many television manufacturers that are developing products that run on the Google TV platform. However, technology enthusiasts will have to wait a little longer than they anticipated for a glimpse at the new television as Samsung says it doesnt plan to unveil it at the next Consumer Electronics Show (CES) in Las Vegas as previously rumored. "We are in our final stages of talks with Google over releasing our version of a Google TV. The product will be revealed next year for sure but not at the CES in January, although we would probably be able to comment on the release date in Las Vegas", said Yoon Boo-keun, chief of Samsungs television business. 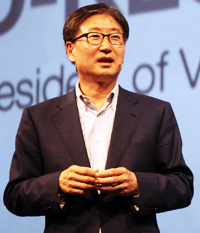 Yoon, a right-hand man of Samsung CEO Choi Gee-sung, stressed that the companys new television will be significantly different from earlier Google TV devices released by rivals like Sony and Logitech. With the absence of the Google TV, Samsungs standout product at the next CES will likely be its new 55-inch organic light emitting diode (OLED) television, which the company has yet to reveal.